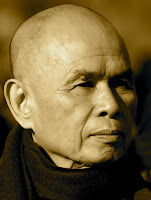 A Year of Being Here: Thich Nhat Hanh: "Walking Meditation"
"Walking Meditation" by Thich Nhat Hanh, from Call Me by My True Names: The Collected Poems of Thich Nhat Hanh. © Parallax Press, 1999. 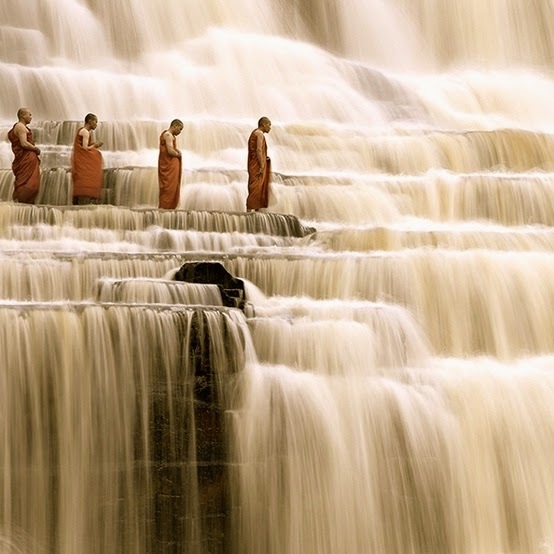 Art credit: "Monks Passing Vietnam’s Pongua Falls," photograph by Lilly Calandrello, taken March 26, 2012 (originally color). Hello there,nice to see your post with walking meditation.I have some words to share.So as a matter of first importance,keep in consideration in the soles of your feet,being mindful of the rotating patterns of contact and discharge;being mindful of your foot as the heel first reaches, as your foot moves forward onto the ball, and after that lifts and goes through the air.Be mindful of all the distinctive sensations in your feet,not only a contact in the soles of your feet however the contact between the toes,the inclination of within your shoes,the fabric of your socks, and let your feet be as loose as possible.Get to be mindful of your ankles.Notice the characteristics of the sensations in those joints –as your foot is on the ground,as your foot goes through the air.Good day.~Renee Lawson.